Atlanta Braves rookie Jason Heyward signed a promotional deal with Topps, the Topps blog posted earlier today. Heyward will appear in Bowman, Topps Chrome, Allen and Ginter and Triple Thread this year. Right now, his only cards are minor league cards and prospect cards. His "rookie cards" will appear later this year in Topps releases. Heyward is off to an amazing start, and the article in Sports Illustrated by Tom Verducci wasn't too bad either. In 10 games, he's hitting .316 (12-for-38) with three homers and 12 RBIs. According to Beckett, Heyward currently has 222 baseball cards, including 116 autograph cards. So what's the most sought after? 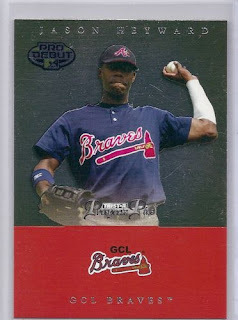 It seems collectors can't go wrong with 2008 Bowman Chrome cards of Heyward. That's if you have the money for them. Speaking of cards I can't afford, Heyward's 2008 Bowman Chrome red refractor /5 and graded a 9.5 sold for $9,500. Yep. It's amazing how many people on ebay think he already has rookie cards out there. Actually it really isn't, people are so gullible. He got a walk against Ubaldo tonight! wouldn't his 2006 Topps card be his RC? From the Topps AFLAC subset... or his 2007 Bowman card??? just because some idiot puts a ROOKIE FOR DUMMIES logo on a 2010 card, that makes it a rookie too? I think for the player collector, it's what you want to make it. If you're just into his cards, but the official super-duper rookie card is the one they put that logo on. It's the one that will end up costing the most money. Or is it poor Mets because that franchise still doesn't have a no-hitter? A little early to call Heyward good, isn't it? He could flame out and find himself in Gwinnett in May (unless the Braves are going to stick with him through heck and high water this season). I'll consider him good if he survives his rookie and sophomore seasons and puts up star caliber numbers when the 2012 campaign is in the books. Too many rookies and sophs had spectacular first and second seasons yet amounted to just a super AAAA-level or average MLB player by the time their career ended. Two out, bases loaded walk-off single against the Rocks today. Awww yeah. Anyone convinced that this guy is Kevin Maas or Joe Charboneau or Jeff Francoeur or whatever flameout overhyped prospect you can think of, please contact me and trade me all your Heywards. I promise you, you will rip me off terribly, but I won't mind. I might have to go look through my boxes of cards now. I love ripping people off.